Zorin OS 12 is the new version of this desktop Linux distribution that was born in 2008 and that has always been characterized for being aimed at users more novice and less familiar with GNU / Linux. 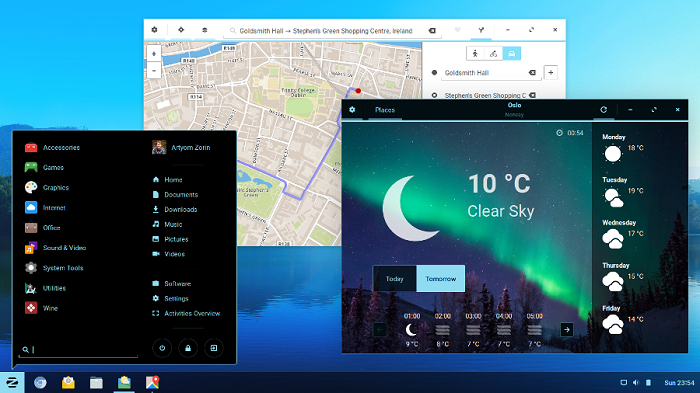 Zorin OS is known for offering an interface very similar to Windows, so that people who come into contact with the distro for the first time have a transition as simple as possible. This great operating system has its own desktop environment based on Gnome Shell and in Zorin OS 12 have included a lot of new features, while still being “very Linux” try to look a lot like Windows 10 in a positive way. Zorin is not a Windows 10 impersonator or a Linux distro with a theme that looks like Microsoft’s system already. It is an extremely complete and functional operating system that makes an effort to be friendly with users who are accustomed to Windows and who try Linux for the first time. There is nothing reprehensible in its forms. In Zorin they built their own suite of Gnome extensions to make your desktop behave familiarly (similar to Windows). Everything is in the places where you would expect them to be : the start menu, the shortcuts to the applications in the bottom bar, the folders in the browser, the power control buttons, etc. The default browser is Chromium, but the user can always go to the Software Store for new applications. Zorin OS allows you to sync your Google files by linking your account from the settings panel, you can access your Drive files from the browser or your Google Photos from the photos application. The new map application allows you to get satellite imagery and directions to go anywhere. They have also created a new and beautiful weather application to review the forecasts in several places. Zorin OS 12 has its own Photo application that replaces Shotwell. And, the new Video app works even with online sources like YouTube and Vimeo. This new version is based on Ubuntu 16.04 LTS, so you will get security updates until April 2021. Zorin OS 12 is ideal for long-term use. Major updates of this distro will arrive only once every two years, during which time security updates and improvements will be sent to the current version.